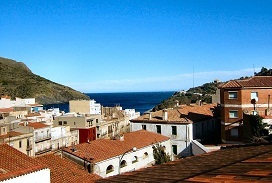 Portbou is the last town of Costa Brava. Before reaching it, after leaving Port de Llanca, there lie the lovely beaches of Grifeu, Garbet, the Bay of Colera, with a small but no less charming township; Cala Rovellada and the Bay of Cap Ras. You can reach Portbou after the point and islet of Gatillepis. It is here that the sea seems to almost disappear. Your attention will be drawn away from the lower part of the town and the beach by the presence of the railway station with its sheds and sidings, and by the mouth of the frontier tunnel into France. The coast is much higher here, with the result that the closely-packed houses and hotels of Portbou slope steeply up the valley from the water. The beach, nevertheless, is peaceful and charming. 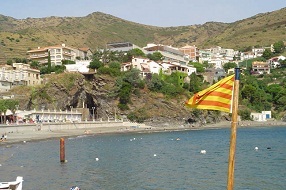 Though Costa Brava ends at Portbou, this town is just the frontier limit between Spain and France; administratively speaking it is the end, but not geographically. Costa Brava continues, following the irregularities of the Pyrenees Mountains as they drop down to the sea. After Cerbere, the French equivalent of Portbou, we come to Banyuls, Colliure and Port-Vendres, three resorts which share the physical characteristics of Spain's Costa Brava.